Workbenches are the central element in a workshop. We provide customizable and functional workstations that can easily be adapted to suit individual requirements on any facility. Our ESD workbenches are designed to prevent electro static sensitive products to be harmed while being handled on the workbench. When a workstation is well planned and well equipped, the workflow becomes easier and more efficient. This fact also improves the ergonomic situation and brings better results on the workers assigned to the workbenches. All our products fulfill the basic requirements of GJB3007-97 ESD-approval certification, and quality certification of ISO-9001:2000. The products are suitable for use in class 10,000 clean rooms, plus all of our steel products have a 3-year warranty. These products will provide you with a healthy, productive and ergonomic working environment. 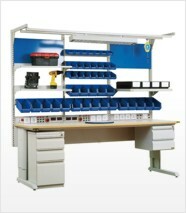 The basic adjustable workbenches are designed for both seated work and stand-up work. Our professional specialists will provide you with a free layout design, so don't hesitate to contact us for an offer.